Loose Bodies are fragments of bone and/or cartilage that freely float in the joint space. They may occur singly or in groups. Individuals with a degenerative joint disease (e.g. Arthritis) or traumatic conditions (e.g. Osteochondritis Dissecans) are more likely to develop Loose Bodies in the Knee. Causes of Loose Bodies are Osteochondritis Dessicans, Osteochondral Fractures, Osteophytes, Synovial Chondromatosis and Large Meniscal Fragments left behind after Partial Meniscectomy. 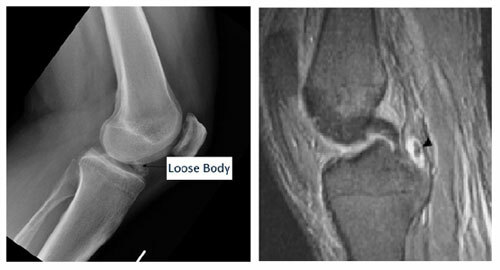 Larger Loose Bodies are typically calcified and thus are easily visible on a plain film X-ray of the affected joint. Loose Bodies that are small or contain little or no bone may not be visible with an X-ray and are typically diagnosed using either CT or Arthrography. MRI may be useful in determining whether associated bone changes have occurred. Common locations of Loose Bodies include the Lateral Gutter, the Suprapatellar Pouch, the Intercondylar Notch and the Medial Gutter. To encourage the best possible management, whenever possible the underlying cause of Loose Bodies should be identified. For Small Loose Bodies, treatment may be directed at relief of symptoms. If pain and swelling are present, Analgesics or Nonsteroidal Anti-Inflammatory medications (NSAIDs) may be prescribed. In general, any Loose Body that is causing symptoms should be removed. 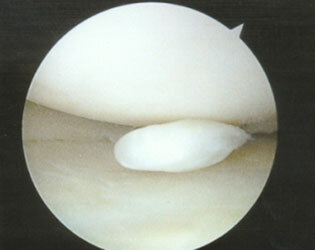 Large Loose Bodies may require removal by use of an Arthroscope (Arthroscopic Knee Surgery). A small suction tip may be used to help draw out the loose body, or it may be held in place by a small needle and grasped with a special tool. Some Loose Bodies may not be retrievable due to their position in the joint space, and an instrument (mechanical burr or resector) may be used to break the Loose Body apart. Once it is in small pieces, it can be easily reabsorbed through the body's normal means of elimination (enzyme degradation). Very Large Loose Bodies and those located in the back of the Knee need to be removed by open surgery (Arthrotomy). Large Osteocartilaginous Loose Bodies can be realigned (reduced) and secured, using pins or screws. 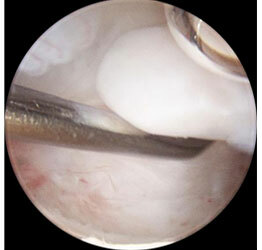 In some cases, such as Synovial Chondromatosis, part of the Synovium may be removed (Partial Synovectomy).